WISER staff members participated in the national Take Your Child to Work Day event on Thursday, April 24th. Take Your Child to Work Day is an opportunity for children to experience what their parents do in the work place on a day to day basis. 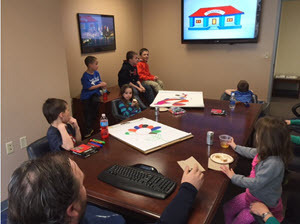 Almost a dozen children ranging from four to seventeen years old attended Take Your Child to Work Day at WISER. Simulation Operations Specialist, Clinton Clegg, began the day with a short kid friendly presentation on how doctors and nurses train to take care of children and adults. Following the presentation, the children watched a video on why kids have to go to the doctor and what happens when they see the doctor. After the video the kids got to donn Bouffant caps and learn how to ventilate SimMan using a bag valve mask. Each child got a turn ventilating SimMan. The kids also got to tour the center with their parents and see the other special equipment students and practicing professionals use each day at WISER and in the hospital setting.